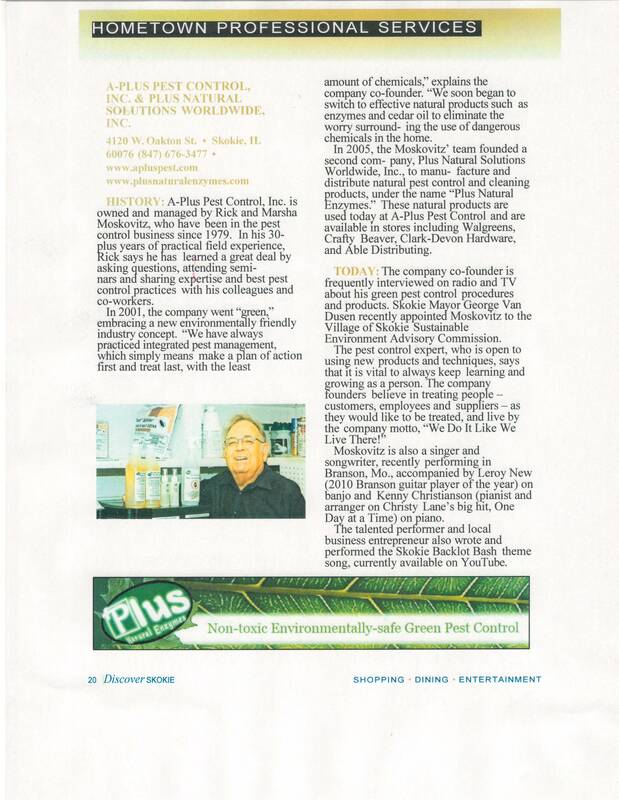 A-Plus Pest Control, Inc. received the 2016 Skokie Business of the Year Award! Finally there’s an all-natural, green alternative to the dangerous chemicals used by other pest control companies. We’re A-Plus Pest Control, Inc., a full-service, environmentally-safe pest control company, serving Chicagoland since 1979. We have replaced chemicals with cedar oil, A Plus Natural Enzymes and other natural products. Our service eliminates both the annoying pests and the worry about using toxic chemicals around your home, apartment building, condo, restaurant (goodbye fruit flies), warehouse, hotel, or other business. Our products are completely safe to use around all family members, including pets. Check out our beautiful flyer! Call in the Spring for our SUMMER SPECIAL! Depend on us for all your pest elimination and inspection needs. Our technicians are experts in bedbugs (bed bugs) and many other pests. We are experts in bedbugs. Building Owners & Hotel & Hospitality Managers: We have the solution to preventing bedbugs before they happen. Ask about our service & our Plus Natural Enzymes line of bedbug products. We are looking for national distribution. Give us a call. 847-676-3477. Now Available: A Plus Natural Enzymes Head Lice Mousse Kit. Here is the Bottle Prototype. The Kit will have the Mousse and a metal nit comb. Non-toxic. Schools & Day Care Centers-Give us a call: 847-676-3477. Call Patrick or Rick now at 847-676-3477 or 888-aplus99 to schedule or if you have a question. Call us in the Spring. 847-676-3477 or 888-aplus99 for a BT (Broadcast Perimeter Treatment) with Plus Natural Enzymes Choice Pro Concentrate (cedar oil), a safe & effective way to keep ants and other critters out. We also offer a Summer Special. 847-676-3477 or 888-aplus99 for a BT (Broadcast Perimeter Treatment) with Plus Natural Enzymes Choice Pro Concentrate (cedar oil), a safe & effective way to keep ants and other critters out. We also offer a Summer Special. The President of A-Plus, Rick Moskovitz, is a Commissioner on the Village of Skokie Sustainable Environment Advisory Commission. Buy natural pest control products, including Pest Eliminator & Bedbug Eliminator for bed bugs Demos link on the Audio/Video tab above. SLEEP EASY WITH FAST ACTION A-Plus Pest Control & Plus Natural Solutions Worldwide is proud to announce the A Plus Natural Bed Bug Elimination System. New name (Plus Natural Enzymes is now A Plus Natural Enzymes), new look. Introducing the new A Plus Natural Enzymes Ready to Use Contact & Residual Bedbug Eliminator (Long lasting) for buildings, hotels, retirement communities, hospitals and professionals. In conjunction with our Ready to Use Contact Bedbug Eliminator (no residual), it makes a terrific 1-2 punch to knockout bedbugs, roaches, ants, fleas or any other insect or spider. A great prevention tool. All natural. Safe for kids, pets & the environment. Guaranteed to work & you can do it yourself. Give us a call for details. NOW AVAILABLE: Ready to Use Contact & Residual Bedbug Eliminator in CONCENTRATE FORM. Just fill the gallon container with water, shake & pour into your Professional Sprayer. A gallon will treat approximately 450-500 sq. ft., about a 1 bedroom apartment or hotel room. Also now available in 32. oz. ready to use bottles for treating without a sprayer. The Contact product now comes in 32 oz., 4 oz. Pocket/Purse & 2 oz. Travel Size bottles. You can even buy A Plus Natural Enzymes Choice Pro Concentrate (cedar oil) & other products from us to do it yourself. Click on the A Plus Natural Enzymes or the Plus Natural Enzymes Logo or call us. 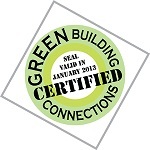 Safe for your children and pets & the environment! 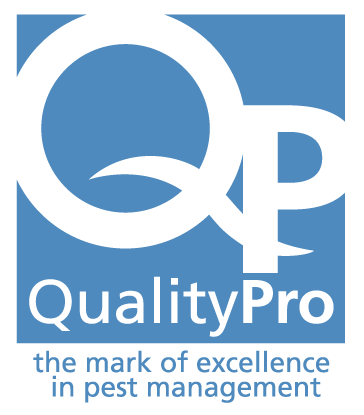 Contact us today if you have cockroaches, ants, mice, rats, bed bugs, centipedes, mice, rats or any other pest. We do it right. Just ask our customers. AND we use our own natural products! See our sister company. Click on the A Plus Natural Enzymes logo to the right. Contact us today if you live in a home, condo or apartment or if you own or manage a restaurant, apartment building, warehouse or any building. We know how to protect you & do it green. GUARANTEED. We have protected the Chicago Area since 1979. Click on the A Plus Natural Enzymes logo to the right for natural products you can buy from us. Call us at 847-676-3477, or fill out a free estimate form now. Go to youtube & put in “Rick Moskovitz” to hear & see the jingle & many other videos. ANNOUNCEMENT: Now available for bed bugs: A Plus Natural Enzymes Ready to Use Bedbug Eliminator & Cedar Choice Mosquito Repellant. You can buy them at selected stores. Call us for names. Also in 4 oz. Pocket/Purse size & 2 oz. Travel size. If your favorite store does not carry our this or any of our products, please ask them to carry it. Also, , for professionals, our new A Plus Natural Enzymes Ready to Use Contact Kill and Residual Bedbug Eliminator. Long lasting. It comes out liquid & dries powder. All of our products are totally natural & safe around children & pets, as well as the environment. We would like your opinion of A-Plus Pest Control. Please use the Contact Us tab and send us a note. By writing a review you are helping A-Plus Pest Control spread the word to others about high-quality products and services, and reward members of their team who provided top-notch service. By submitting “suggestions”, you are helping A-Plus Pest Control monitor any areas where improvements could be made in order to maintain high levels of customer satisfaction. Your reviews, feedback and suggestions are greatly appreciated. On Aug. 9th, Rick did a seminar on bed bugs & ants at the Chicago Center for Green Technology again.